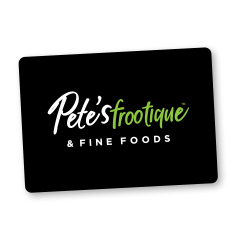 Treat them to their own good tastes with a gift card from Pete’s Frootique & Fine Foods. Available in multiple denominations. Shipped via Canada Post regular mail (2 – 4 business days depending on destination).